Guts & Gluten: A Step-by-Step Guide to Gluten-Free Living. Check out my new book that gives you the 11 essential steps to transition to a gluten-free lifestyle. It has over 20 great recipes, a week sample meal plan, numerous cooking tips, education on food labels, and so much more. This is a must have for living gluten-free! I kept it at an affordable rate so everyone can have access to it! Click the image below to purchase. Click the button below to gain FULL ACCESS to Gluten University. Here you will learn the steps for gluten-free living. DIRECTLY RELATED TO CELIAC DISEASE AND GLUTEN INTOLERANCE. YOU DON'T HAVE TO HAVE CELIAC DISEASE TO BE GLUTEN-FREE! Please note disclosure policy HERE. eMeals is a weekly subscription with full access to their entire range of healthy recipes crafted and curated by a professional food team and registered dietitians. They offer a gluten-free menu and even specific diets. This is your once a week sanity, that shows up in you inbox and takes the load of what to cook. Below you will find the different gluten-free options that they offer. Click on the icon below to take you directly to their website. Vitacost originally known for their discount vitamins and supplements are now paving the way for affordable health foods, beauty products & more. Check out their gluten-free options by typing in gluten-free into their search. Shipping Charges: Free Shipping on orders over $49. The Gluten-Free Mall is known as the special diet superstore! It is your online gluten-free grocery store. Check out their huge inventory of gluten-free foods. Shipping Charges: Free Shipping for dry orders over $39. Click HERE for frozen foods shipping charges. iHerb is know for their large variety of quality products. They offer supplements, beauty products, pets, home, grocery, and more. Also, you can't go wrong with free shipping on any purchase over $20. Allergy Test discovers the causes of allergy, sensitivity or intolerance symptoms fast with one of their home-to-lab tests. For over 10 years they have developed market-leading health tests that have helped people all over the world. Get a special 20% glutenwatchers discount by using glutenwatchers20 as coupon. 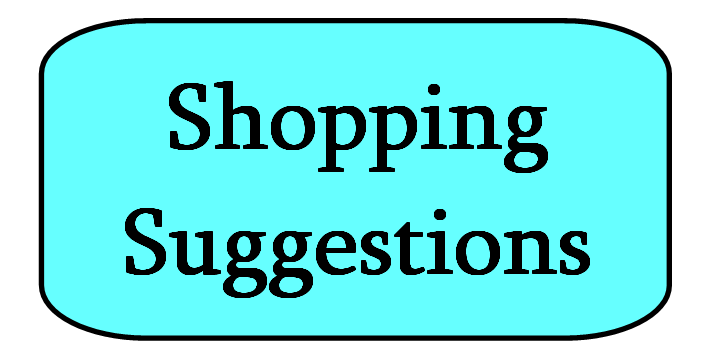 This icon will direct you to a page with lots of shopping suggestions. It includes everything from gluten-free make-up, hygiene products, food options, and more. Discount School Supply offers the best variety of school supplies, arts and crafts supplies, teaching resources, educational based toys and games and learning tools for children, parents and teachers. The best thing is they lists whether common allergens are absent in the products, including gluten. This is a big help especially with paints, molding dough, and other art supplies that often contain gluten. Do you have questions or concerns regarding the gluten-free lifestyle? Fear no longer, schedule a consultation and let me help solve those dilemmas! Find out more information by clicking the button below.